If you are the first time climber and you want to climb Kilimanjaro in few days, we suggested you climb Kilimanjaro via the easy Marangu route. The 5 days trek itinerary is the only easygoing to Uhuru peak on Mount Kilimanjaro Climbing because of its gentle slopes but need optional acclimatization day that one can reschedule to 6 days. The Marangu route is known as Coca-Cola Route meaning simple like Coca-cola. However, it is the only route on the mountain which offers accommodation in sleeping huts and serves beverages like Coca-Cola on the way. Day 01: We leave Moshi to Kilimanjaro gate – Mandara Hut. We will have a short drive from Moshi or Arusha town to Mount Kilimanjaro Park Gate (1,830 m.) lies at the edge of Marangu, which is a beautiful village with many small coffees and banana plantations. After finishing the entrance procedures, we climb up through a gorgeous and pristine forest to reach the clearing encompassing Mandara Hut (2,700 m.). The volcanic remains of Maundi Crater are nearby and make a good afternoon excursion. Another option is to rest and enjoy the elegant forest. There is a rich birdlife at the huts and monkeys are often seen as well. The first part of the walk is a steep ascent through the forest, but the path soon opens out into grassy moorland and, in clear weather, there are good views of Kibo and Mawenzi peaks. We climb steadily through the moorland zone, containing giant heather and occasional stands of groundsel, to eventually reach Horombo Hut (3,720 m.). Sunrises and sunsets here are often very stunning, the site is close to the glaciated dome of Kibo, and there is a real sense of being above the clouds. we climb very gradually towards the lunar desert of the Saddle between Mawenzi and Kibo. The terrain changes to scree and there is a palpable sense of high altitude wilderness. We usually reach Kibo Hut (4,700 m.) at the bottom of the crater wall by midday and the afternoon is free (to contemplate the summit ascent!!). The remainder of the day is spent resting and eating in preparation for the final climb before a very early night! We will start our ascent by torchlight at about 1 a.m. so that we can be up at Gillman’s Point by sunrise. The initial climb is steep over the loose volcanic screen, but there is some well-graded zig-zag and a slow but steady pace will have us up to Gillman’s (5,685 m.) in about five or six hours. We will rest there and spend some time taking in the sunrise. 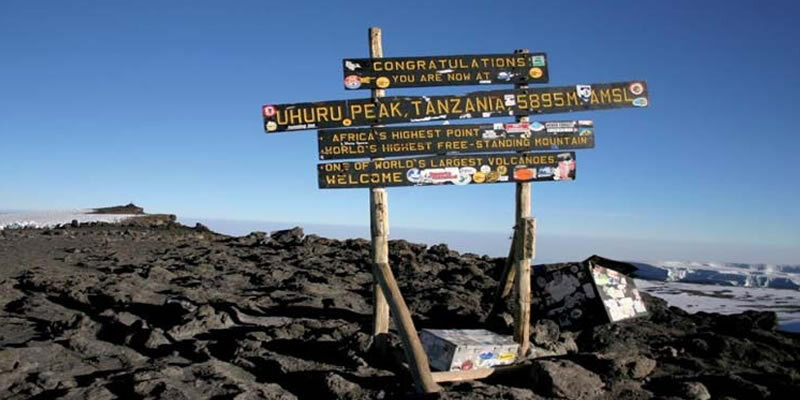 Those who are still feeling strong can make the three hours round trip from here along the crater rim to Uhuru Peak (5,896 m.), passing close to the spectacular glaciers that still occupy most of the summit area. The descent is surprisingly fast and we return to Horombo Hut for the night. Safari to Kilimanjaro Retrace through Forest We retrace our steps with a pleasant moorland walk to Mandara and then a lovely forest walk to the National Park gates to Moshi or Arusha town. The greenness and lushness of the forest are quite a stunning contrast to the summit day, and it really makes you realize how varied the scenery on Kilimanjaro really is.